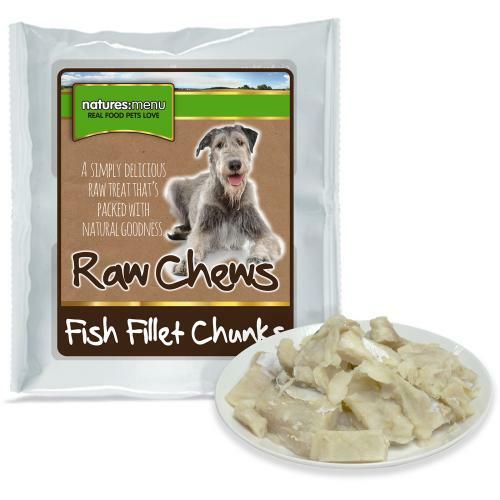 Nature's Menu Fish Fillet Chunks are a naturally low fat source of protein that is gentle on sensitive stomachs, made with only 100% natural and ethically sourced white fish. To ensure your four legged friend gets a complete and balanced dinner, it is recommended that each meal be prepared with 60% Nature's Menu meat or mince, 20% blended fruit or vegetables, and 20% easily digestible carbohydrate such as cooked brown rice, oats, or sweet potato. Fresh water should always be available. Keep frozen until use. Defrost in a sealed container on the side for two hours or in the fridge overnight. Once defrosted please use within 24 hours. Normal hygiene rules apply for preparing and handling fresh/raw ingredients. Nature's Menu frozen raw pet food will be delivered by our trusted supply partner separately to any other items in your order in order to ensure your food stays frozen all the way to your door. Thinking of switching to Raw but not sure how? Read Nature’s Menu’s Transitioning guide here. Crude Protein (16.2%), Crude Fat (1%), Crude Ash (1.5%), Crude Fibres (<1%), Moisture (80.5%).